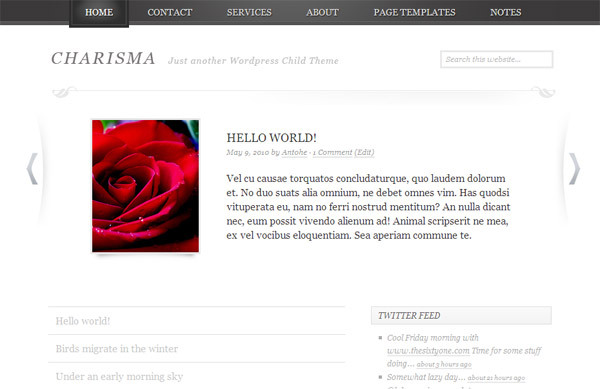 Charisma is a free Genesis child theme that will work perfectly for your WordPress personal blog. When I started designing Charisma I had in mind an elegant, simple, well structured theme which highlights the content and gives the user a pleasurable reading experience. The home page has a beautiful slider, and below it lists the most recent post titles. I created a new widget area that appears only on the homepage and you can add the default featured articles widget or featured page widget from Genesis Theme Framework. So why Genesis you might ask? To be honest I wanted to experiment with frameworks other then Thematic to see how they work. I’ve used bits from Hybrid in the past and this is how I’ve tested Genesis, by building a child theme for it. To be honest I was pleasantly surprised. The code is really easy to understand, there are plenty of tutorials on the support forums, the css is straight forward and the html really let’s you create any layout without any problems. I’ve also liked the widgets Genesis comes with by default. They speed up things quite a lot. Charisma was built on top of the Genesis framework, so it inherits all it’s functionality. In order to install it you have to buy the Genesis Theme (this is an affiliate link), upload both themes (Charisma and Genesis) to your server in the themes folder AND THEN ACTIVATE the Charisma theme. If you have any question regarding this theme you can always visit the Cozmoslabs forums for help (www.cozmoslabs.com/forums/forum/charisma). However, for questions regarding the Genesis Theme Framework please make use of the excellent support StudioPress provides. May I make one small recommendation? The gray color used in the sidebar and bottom of the homepage makes it difficult to read – since I take it you really want the focus to be on the content, perhaps you could make it a bit darker without going full-out black? Just a thought! I’m getting “broken theme” errors when using this. I’m using Genesis 1.1.3 and just download this child theme last night. When I try to activate it, WordPress gives an error that says the theme is broken. Got it. It looks like uploading through the theme uploader causes the problem. It only puts the psd folder in the theme folder, not the actual theme files. I manually uploaded and it works just fine. I’ve converted this theme to Blogger. Have a look at it. That looks great! Sorry I didn’t get a chance to answer your email. Lately I’ve been really busy. I’m sure blogger users will appreciate it a lot. Keep up the good work. How can I use the .js files to upload the template to my blog? This Theme looks great but i dont like some features of this charisma theme like the colour combination and width size looks smaller. I’ve used many WordPress themes but Charisma is the most elegant theme. I like the fact that it’s so smooth! I like this theme, is nice and clean. I’m going to try it out, but first it needs a little tweaking, the gray text is kind of hard to read. Hey, you have presented a nice free child theme for the WordPress users. I’ll have a look. Have a good day! I like your theme. I am also created “Magnus7 Pro” genesis child theme and published it for free. Now I have published my 2nd theme as “Logo7 Pro”. If you get time you can check out inmy website.